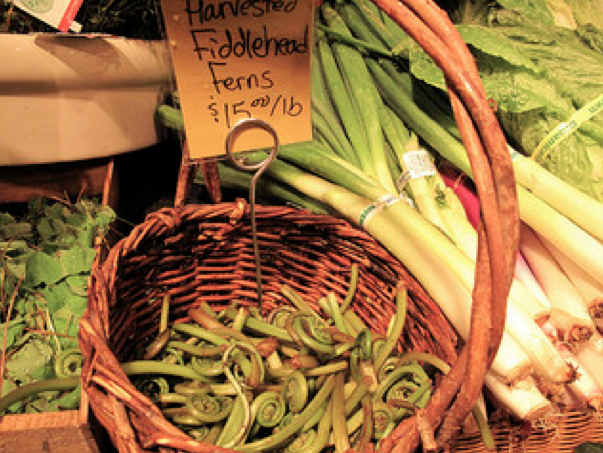 If you're keen to start eating with the seasons, there is nowhere better to start than in the Spring with Fiddleheads. These beautiful little plants are so called because they resemble the head of a fiddle as they unfold. 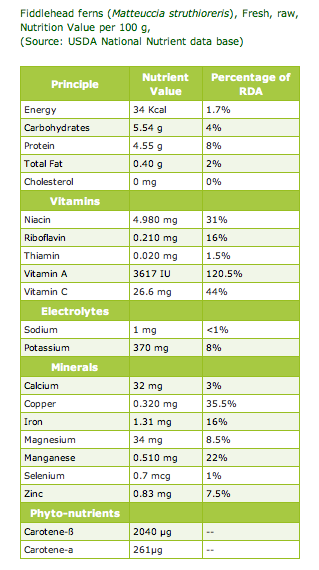 But they are not only beautiful to look at, they are also a nutritional powerhouse as you can see from this chart published by the USDA. 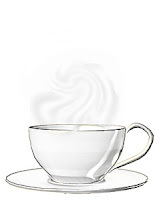 They have only 34 calories per 100g, so have a very high nutrition calorie ratio. Very high in vitamin A. A serving contains 120% of the suggested daily requirement. This vitamin is essential for healthy skin and protects your eye sight. They also contain 44% of the daily requirement of vitamin C, protecting you from colds, inflammation and some cancers. A very good source of minerals and electrolytes, especially potassium, iron, manganese and copper, helping to reduce high blood pressure. 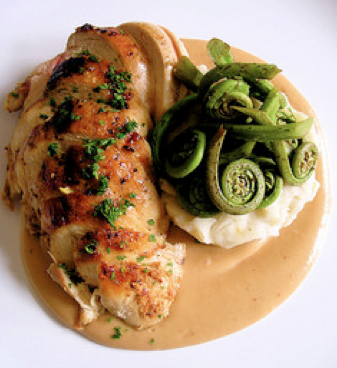 Fiddleheads also contain small to moderate amounts of some B vitamins such as niacin, riboflavin and thiamin. 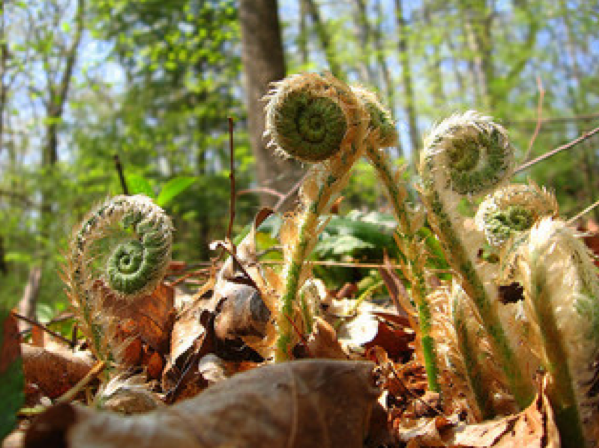 Fiddleheads grow so quickly that they must be picked the day after they sprout otherwise they will quickly grow into ferns. They grow wildly in North America, most abundantly along the East coast. In early spring, especially after a light rain, you will often find that they have popped up overnight. The best place to look for them is in a shady wooded area, but if you've never picked them before it's best to take a foraging course or to go with someone who has had a bit of experience. If foraging seems too much like hard work, these are also commonly available in grocery stores. Look for bright green plants that are tightly packed and have no brown spots. They will keep for up to two weeks in the fridge. If you are keen to try them pick them up as soon as you see them. The season is so short that they fly off the supermarket shelves as soon as they appear, and if you don't grab them right away you will probably miss out. 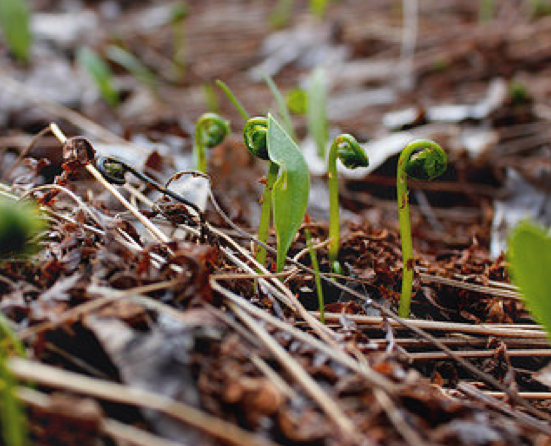 Fiddleheads need to be well cleaned before you use them, but this is easy to do. Just dump them into a pot of boiling water and cook them for a minute or two. Then strain and rinse with cold water. 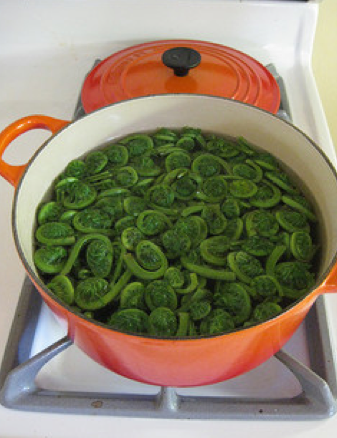 Any dirt and scales will go down the drain, and you will be left with clean ready-to-eat fiddleheads that you can either cook right away or freeze for later. These tender little plants taste very similar to asparagus and can be used in many of the same recipes. They make a nice change in creamy soups, quiche, or even just quickly stir-fried as a side dish for your favourite seafood, poultry or meat dish. 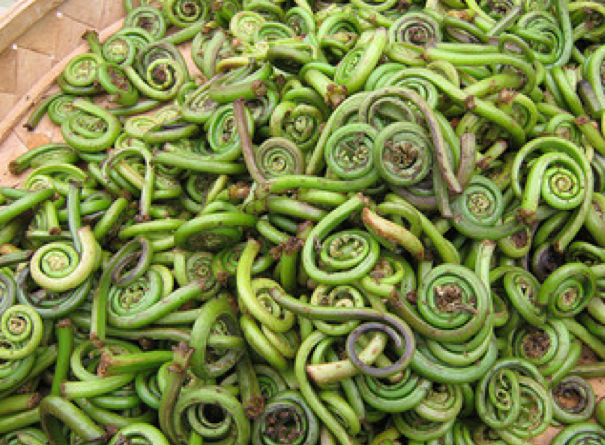 The easiest method of preparing fiddleheads is to stir-fry them. Put them into a pan with a knob of butter and a little garlic, season with salt and pepper, and cook over high heat for just 2 or 3 minutes until tender but still crunchy. Once cooked you can also refrigerate them and add them to your salads during the week. However you choose to eat them, fiddleheads will not only add variety to your menus, but give you a nutritional boost as well, and you can feel good about eating locally and in season.